Growing up in Ireland in the mid-1980s couldn’t have been easy. The country was mired in recession and a steady stream of the country’s youth was heading for the port of Holyhead to catch a one-way ferry ride to the UK. Whether or not the opportunities were any better in London at the time is debatable but the common opinion in Dublin was that there was no bright future to be had at home. Set against this backdrop comes SING STREET, the third film about musicians by Irish writer and director John Carney who previously delighted us with ONCE and BEGIN AGAIN. This new film takes its name from the state-school in Dublin (Synge Street CBS) where Conor Lalor (newcomer Ferdia Walsh-Peelo) is forced to attend after his parents, played by Aiden Gillan (Petyr Baelish on TV’s GAME OF THRONES) and Maria Doyle Kennedy (Vera Bates on TV’s DOWNTON ABBEY), do a bit of fiscal belt tightening due to their own worsening economic situation. For Conor, the news couldn’t be worse… until he steps foot onto the school grounds. Synge Street is a rough-and-tumble school where rowdiness and fighting are commonplace, and where the Christian brothers who run the facility strictly enforce the rules – one of them being that all boys must wear black shoes. As Conor’s stylish shoes are brown, he has to go around school wearing just socks on his feet until he conforms. Conor’s fortunes begin to turn around when he spots a mysterious girl across the road from the school. Though Raphina (Lucy Boynton, MISS POTTER) is way out of his league, Conor isn’t deterred and he concocts a story that he’s looking for someone to star in his band’s next music video. The lad may have bitten off more than he can chew though. He doesn’t have a band and he can’t sing that well either. But, with the help of his new friend, the dorky Darren (Ben Carolan), they find some other guys at school who can play various instruments and they hastily put a band together. Not knowing what kind of music they want to play, Conor’s slacker older brother, Brendan (Jack Reynor, WHAT RICHARD DID), comes to their aid. Brendan – who looks a lot like Seth Rogen – plays a musical Yoda, lending Conor his albums by The Cure, Duran Duran, The Jam, Spandau Ballet and other hot bands of the day. Through the music, Conor and his friends create their own New Romantics-inspired tunes and produce homemade videos starring Raphina as their muse. SING STREET is loosely based on filmmaker Carney’s own experiences growing up in Dublin at that time. (He’s also a graduate of Synge Street, though he points out that the school today is nothing like how it is depicted in the film.) He certainly knows how to make feel-good films and this one might just be the best of the three he’s done so far. (About an hour into the movie, I realized that I hadn’t stopped smiling.) As Conor studies Brendan’s LPs, the group comes up with songs – and fashions – that unabashedly mimic each band to humorous effect. Meanwhile, he and Raphina grow closer as they learn more about themselves and each other. This is one thoroughly joyful and nostalgic, coming-of-age film that anyone who listened to that music back in the day or ever learned a musical instrument in order to impress a girl will love. The scene where Conor imagines the perfect music video is movie magic. When you watch it, you will be singing along with Conor and believing that all his dreams really will come true. SING STREET is my favourite film so far this year. It will probably be yours too. 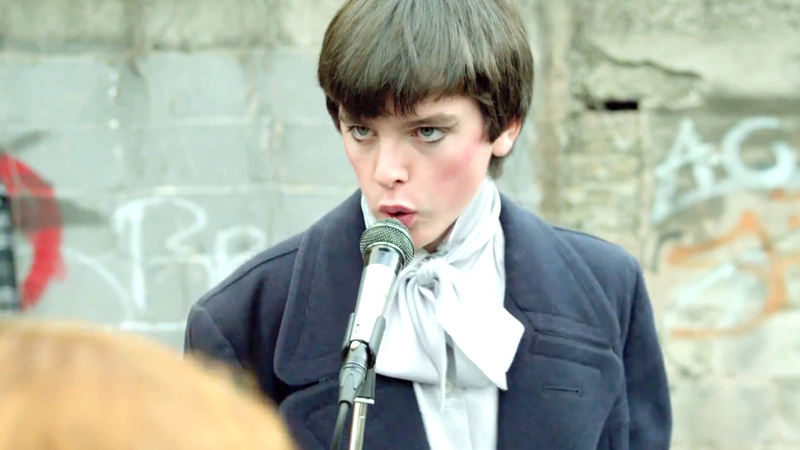 Fantastic review — “Sing Street” is also our favorite film of 2016 so far. It’s going to be hard to top for sure. I totally agree with you and loved it too. This is a joyful upbeat film that expresses youth’s unshakeable belief in the power of music….a great little gem from The Emerald Isle.